I see Kathy on the main stage, warming up 20 000 people with the joy of zumba. Everyone’s enthused by her never ending energy! That’s quite a crowd – it’s pretty awesome hey?! I’m so proud that she’s my trainer! I guess she’s already achieved a personal best today! It’s a glorious day in Sydney and the sun is shining. I’ve power snacked on my banana and Katie’s Chocolate Apricots so I’m full of fuel! 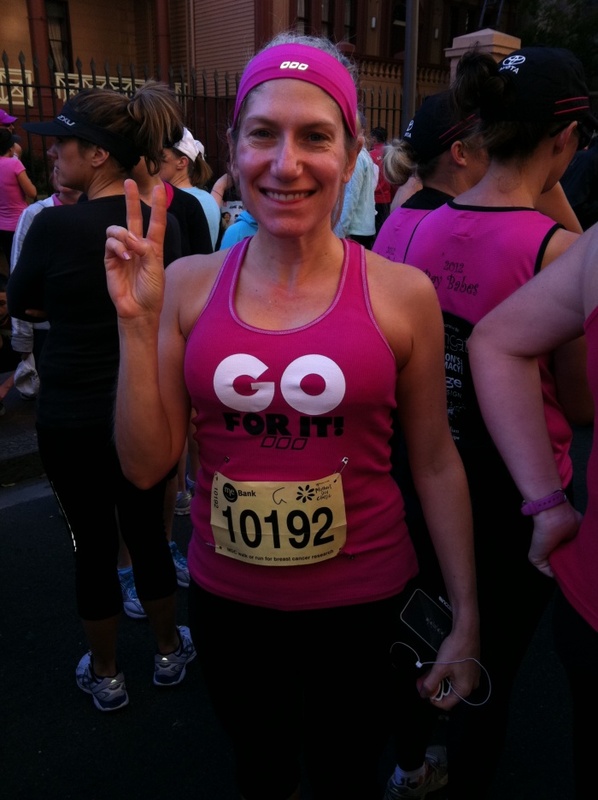 I’m in the pink and ready to run. I make it to the start line in plenty of time and just can’t wait to get going. Thank goodness I remembered my sunscreen, it may be Autumn, but the sun is still sizzling! There’s a massive bottleneck at the start which forces me to go slow and holds me back. I feel incredibly irked until I remind myself that this is a fun run after all! It’s the taking part, not the time on the clock that counts! Sure I’d love to run a personal best, but I should be grateful that I am fit and healthy enough to run at all. Looking at the tribute cards on the runners’ backs, I realise some people aren’t so lucky and I humbly put myself in my place and run a comfortable pace. It’s hot and it’s hard but I cross the finish line, and according to my trusty ASICS app, I’ve achieved a new personal best! (It must be those chocolate apricots!) I won’t know for sure until the results are in but I’m feeling pretty proud! I get my pink bag containing my medal and pink tipped banana, and then head for home! After a quick change and a nice cup of tea, I’m out for a ride in Adam and Leda’s new car, Victor the Vectra. Their family is set to double in number within the week, what with the new wheels, and the new baby about to make it’s grand entrance! We go for a spin up to the Northern Beaches, take a stroll by the ocean and fall in love with the stunning scenery. It’s stoved off being Mother’s Day but we grab a table at a beachside bar for a quick drink, a catch up and to watch the world go by! A Sunday wouldn’t be a Sunday without some kitchen chaos but today I have an organised afternoon. First, I put some of my auntie’s Sandra’s Champion Chicken Soup on the stove. David is still well under par and this is for him, after all, there’s good reason, why this little bowl of goodness is called Jewish Penicillin! Tonight, dinner is coming from the slow cooker. I love cooking in the slow cooker because it’s a one pot dinner and you can clear up, kick back and serve supper in a sparkly clean kitchen! I’ve chosen the low fat, high fibre Slow Cooker Prawn, Pea and Tomato Curry and if it tastes as good as it smells, we’re in for a treat! Jim and Anton are coming for dinner tomorrow, so there’ll be Sandra’s Champion Chicken Soup to start. That’s a given! As we’re celebrating both their birthdays, I want something special but make ahead for dessert. I’m going to try my luck with the Tia Maria Cheesecake and hope for the best! The race is run, the soup is cooked, dinner is served and the cheesecake is chilling. Time for a rest!